Lawrence Auster of VFR often has good ideas, but when it comes to presidential elections, he is not very useful. Last time around, he decided to launch a protest vote, not by supporting an actual third party candidate, but by writing in Tom Tancredo, who wasn't even running. Now this time around, he has decided to endorse Romney, or in other words, four more years of the same. He supported Tancredo at first, but after Tancredo dropped out, he made it clear that Paul was not a man he could support because Paul he doesn't like Lincoln, because Paul doesn't think that we have the right to do whatever we want around the world and expect other countries to welcome it, and because his stance on immigration, although in practical terms probably tougher than anyone except for Tancredo or Hunter, is not based on the correct arguments and might get weaker in the distant future once (and if) all of his economic ideas were passed. All of which would be fine if Auster had decided to sit out the race and endorse no one. But he has in essence endorsed Romney, meaning in essence he is supporting four more years of the same policies as we have had for the past four years. So by all means read VFR for Auster's policy insights. But don't expect his decisions on the presidential election to be anything other than what you would find at any mainstream "conservative" organization. I generally gauge the success of our efforts to tamp violence down in Iraq by the coalition hostile death count. According to the latest data, we seem to be settling into late 2003, early 2004 territory, with death tolls in the 30s. The death toll has been around 30 in 3 of the last 4 months, and after dipping to 14 in December, is at 32 (so far) in January, suggesting that the decrease in violence has bottomed out. I have been unwilling to make statements of this sort previously, because complaining that the violence "has been brought down only to 2006/2005/2004 levels" seemed unfair as long as the decreasing trend was continuing; but now that the level seems to have stabilizd at a new equilibrium, it is fair to start using the current numbers as the measure to judge our current strategy (at least in terms of violence levels against the coalition, which increasingly means just the U.S.). If there is a clear Democratic winner, the Democrats will almost certainly count all of the Florida and Michigan delegates. But if not, and if these delegates make a difference, then they might well not count them - why? Because if these delegates make Clinton the nominee over Obama, the Democratic Party is going to alienate a whole lot of blacks who will feel that they were cheated. Same is true if the superdelegates make the difference; that is, if Obama wins the delegates in the "officially counted" states but loses once the superdelegates are counted. I haven't yet heard anyone bring up the racial angle to this, but it seems clear as day to me. An interesting piece in the Metro Boston News. Gary North on our precarious financiual situation. I was thinking that Obama's win in South Carolina is a little like Mitt's win in Nevadda. Both won majorities in these respective states, in fact Mitt and Obama both won about the same percentage (Mitt's win seemed bigger because the remaining votewas split between more candidates). In addition, both had wins that were to some extent affected by identity politics, with Obama winning 78% of the black vote (~50% of voters in SC, I think) and Mitt 94% of the Mormon vote (25% of voters in NV). The big obvious difference is that Mitt's win was only increased by the identity issue while Obama's was driven entirely by it, with Obama coming in third among white voters while Mitt still would have beaten the second place contender (my man Ron Paul) 2-to-1 amongst non-Mormon voters. What is very interesting about Ron Paul is how unfair the media have been to him in the debates, and in particular, how the media are now all pulling a Fox and trying to ignore him. For example, in the October CNBC debate, Ron Paul got less time than Huckabee, Brownback, Tancredo or Hunter, despite the fact that he had a higher fundraising haul n the 3rd quarter than any of them. Then, yesterday, he received the least time of any of the GOP candidates in the MSNBC debate, despite the fact that he has beaten Rudy Giuliani in all but one (maybe two, I don't know about Wyoming) of the contests held so far. And no one is discussing him anymore. After the debate yesterday, almost no mention of him was made until the text poll rankings came up. It's always easy to tell how Ron Paul does in a primary; you need merely count the number of finishers reported, then add one. If this means the media has to fail to report any of the finishers from second to sixth place, as was the case with the Nevada caucuses this weekend, well, that just leaves that much more space to anoint this week's "frontrunner." And let's not forget the near blackout of Louisiana's caucuses, where Paul either did very well, or did even better. What the President and Congress are proposing as an "economic stimulus package" has one terrible downside: they are, in the end, just shuffling money around. No one is actually increasing the amount that the U.S. is producing. No one is cutting spending on something wasteful and letting taxpayers use it instead. No one is trying to increase investment by freeing up funds from the insane Iraq War. No, the government is just giving everyone money it must print or borrow from foreign countries to everybody with the hope that we will use it to consume enough to mask the economic problems that are coming - actually, most of them probably are stupid enough to think it will actually work. We need to bring the troops home from not just Iraq, but Korea and Europe as well. That would be a real economic stimulus. Jim Bradley on the Fed, the business cycle, and the current unpleasantness. Very busy the past few weeks. We're Number One Four! We're Number Four! Paul is in fourth place in Michigan with 6% of the vote - ahead of Thompson and Giuliani! Yay! Is that they think that every problem requires the government to engineer your neighborhood, your environment, your school in order to make it fit their idea of social justice. They won't just let you alone to live in peace. This post (which I found from a link on Alas) is, I think, a good example of this. Gary North on the "rEVOLution", and a link to a suggestion that there was ballot tampering in New Hampshire as an explanation of the poll/election results discrepancies. I don't know if there was any fraud or not, but I do think that the system should be as transparent as possible to avoid even the appearance of impropriety. I need some time to find more good blogs, and then it takes a little while for me to Photoshop the graphic links, so I will suspend "blog of the week" for a the time being. I have only updated it once in the past year or so anyway. I'll try to comment on this (there is more here) after I have time to read all of the relevant articles. Update: I do not think Paul is a racist and I plan to defend him, but I want to read everything first so that I know what to defend him against. 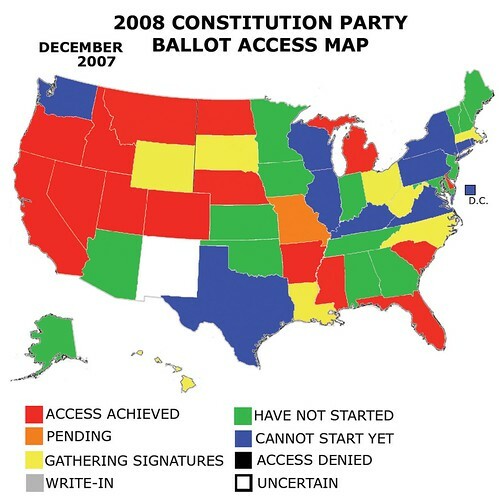 is the current ballot access map. P.S. I am too tired to find the specific pages that this map was derived from, so the links are to the websites' front pages. Michael Schwartz offers an alternate theory as to the decreased violence in Anbar, and quotes to a list of arguments Juan Cole made against the idea that recent trends show that victory is imminent. The graphic novel of The Probability Broach is available online! Paul came in fifth in Iowa. Oh, well, it was fairly close, I think. Sorry for lack of blogging recently. Been away from my computer for a while. Then I had to go back to work. Now, for a blog post that is not about blogging: for what it is worth, I predict a 3rd place finish in the Iowa caucus for Ron Paul.